This Brass plaque is situated on the footpath in North Terrace in front of the Art Gallery. Published by the City of Unley, 1990. HAVING made the decision to emigrate, the Mills family, consisting of Richard, his wife Sarah and their five children, left their home at Hadlow, near Maidstone in Kent, England and sailed from Gravesend on the ‘Royal Admiral’ on 25th September~ 1837. After a voyage of three and a half months they arrived off Glenelg. They must have felt somewhat daunted by the heat and dryness that following summer, after leaving the beautiful green countryside of Kent, but they soon settled down at Brownhill Creek where they waited for a chance to buy farming land, for Richard had been a yeoman farmer in Kent. For a while he was a shepherd for Matthew Smillie, who founded the township of Nairne. While shepherding in the hills near Nairne, Richard came upon land at Black Hill Valley that he liked, he and the family ‘squatted’ until the land was surveyed and he was able to purchase it. Three more children were born. One son, also Richard, after forays into mining at Burra Burra and Victoria, leased land at Native Valley, settling there with his wife, Anne Margaret, daughter of another local settler Robert Henry. They raised five children, one of whom was William George James, the father of May Mills. After the death of his mother, Sarah, Richard junior moved back to what was then known as Millbrae, Black Hill Valley (later this whole area was known as Native Valley) with his family. Richard senior died in 1874. William George James, son of Richard junior, married Lizzie Martha Champion. Lizzie’s parents, Thomas, a builder and architect, and Sarah with their six children had arrived in South Australia in 1878, taking up residence on Unley Road, where the Soldiers’ Memorial Gardens now are, opposite St. Augustine’s Church. Two of the daughters sang in the choir. After her father’s death in 1880, Lizzie the eldest child, then aged 18 years, applied to the South Australian Education Department for a position as teacher. The school she was sent to was Springfield, Black Full Valley. When she arrived by train at a siding near Aldgate, she was met by William Mills, then aged 20 years. Romance developed and in July 1882 the two were married. They lived at Millbrae and raised nine children. May was the fifth child and second daughter, born 18th July, 1890. May remembered with love the delight of listening to grandfather Richard singing Kentish folk songs and telling tales of his early years in the colony. The widowed Mrs. Champion moved with her children to a cottage in Nairne, one of her daughters, Finetta, married a son of one of Mitcham‘s pioneer families, Ebenezer Finlayson. Ann Margaret wife of Richard junior, died in 1885, Richard in 1902, having some years previously married Mrs. Anne Mollerus. May rode to school on a dray drawn by Topsy, a half-draught horse trained especially for the job, with some of her brothers and Sisters. Along the way they picked up other children on their way to the school. After primary schooling there was no secondary education available locally, so May boarded at Methodist Ladies College, now Annesley, Greenhill Road, Wayville, with two of her sisters. Home at Millbrae life was a busy round of chores, but May took pleasure in work and a job well done. The Merino stud built up by William and his late father became popular with buyers from all States, it was May’s job to meet the buyers at Nairne station, eight miles away, and drive them by horse buggy to Millbrae and back. In July, 1914 May followed in her mother’s footsteps and went off to become a teacher. May’s brother Thomas, who had enlisted to fight in the war, sadly died after contracting ‘Cerebro-Spinal Meningitis’ at Mitcham Camp. Two other brothers, Jack and Alec, also enlisted. Jack was killed in France and Alec was wounded in the same offensive. On his return from the war Alec was taken into partnership with his father and on 29th October, 1919 he married Phoebe Matilda, daughter of the Reverend John Blacket, then a Methodist minister at Salisbury. Phoebe was one of 14 children of John and Martha Jane Blacket. John, son of Ebenezer and Matilda Blacket, had spent his youth in Goodwood. He wrote his reminiscences of those years in the “History of Unley and Goodwood” and wrote other historical works about South Australia. During the war May taught in country schools and was trained as a teacher, her appointment to Unley High School came in 1918. She remained there as a specialist geography teacher, and later also sports mistress, for 35 years. May was known as a good, effective teacher, strongly committed to her subject. At the time of her retirement from Unley High School she was a member of the Education Policy Board and University Geography Committee. She had been the first woman to present a paper to the Royal Geographical Society and to have a paper published in its journal. She was the president for two terms of the High School Girls’ Sports Association. In 1956 when illness depleted the teaching staff at Methodist Ladies College, where May had been a pupil herself over 50 years previously, she went back as a relieving teacher. Meanwhile in 1918 William had been elected to the Upper House representing the Farmers and Settlers Association (which later became the Country Party). Alec was left to manage Millbrae and a smaller property at Shepherds Hill was purchased by William so that he would be nearer his legislative duties. A fine-woolled Merino stud was established there while Alec cared for the medium fine-woolled stud. With the move to Sturtbrae in 1923, May sold her home at Blackwood, bought herself a car and moved in with her parents. During the holidays May put her car to good use going with a girl friend to country districts to put the Country Party platform to the people. They learned a lot about the hardships still endured by country people, but were pleased to find the pioneering spirit still flourished. When William died in 1933, the two unmarried daughters, Margaret and May, bought the property, giving a home to their mother, Lizzie. Lizzie died in 1962 in her 100th year. President of the Teachers’ Union and a Life Member of the S.A.
Australian and State Convener of the Cinema and Television Committee and set up a panel to view all films likely to he seen by children. She sponsored the establishment of the S.A. Film and Television Council and was President for one term, appearing before the Inquiry into the number of television stations to operate in South Australia. May was also involved in the Youth Welfare Co-ordinating Committee and when this became the Council of Social Services undertook the Vice-Presidency for some time. Another interest was women’s sport and May was a member of the S.A. Women’s Amateur Sports Council, serving as President for seven years. She was President of the Australian Women’s Cricket Council and the S.A. Women’s Cricket Association and became a life member of both. May helped finance the Memorial Playing Fields on the corner of Ayliffe and Shepherds Hill Roads. 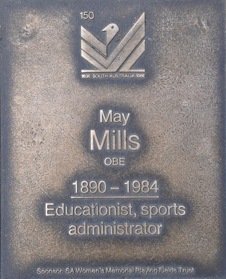 For her services to education and for her work in establishing the Memorial Playing Fields, May was awarded the Order of the British Empire (OBE) in 1960. From 1963 administration of the Playing Fields was taken over by the Women’s Playing Field Trust and May became President and Life Member. A pavilion there was named after her in 1967. If all that were not enough this grand lady found time in 1959 to stand as Liberal and Country League candidate for Edwardstown, standing against the deputy leader of the Labor Party, she put up a good fight but was defeated. The list is not complete yet for May also found time to serve as President of the Army Nurses’ Fund, served more than 50 years with the Royal Commonwealth Society, planted an almond orchard at Sturtbrae as well as managing the farm with her sister, until in 1965 sub-division took place. The sub-divided area is now known as Bellevue Heights, Flinders Medical Centre was built on another part of the land. It was at this hospital that she died on 29th January 1984 aged 93 years. A friend recalled that she still drove her sports car until two years before her death. This selfless, community-spirited woman, so devoted to her family and with a deep love of her State and Country, its flora and people, was buried with members of her family at St. James’ Church, Blakiston. ‘Millbrae and its Founding Family’, May Mills, 1973, Lutheran Pubi. S.A. All background information on the Mills family has been taken from this book. (1)	‘History of Unley and Goodwood’ Rev. John Blacket, 1932, City of Unley Pub!. (2)	‘State High School Unley 1910-1985’, Craig Campbell, 1985, Page Productions. (3)	‘To Grow in Wisdom: The Story of the First Seventy-Five Years of the Methodist Ladies College 1902-1977’, P.M. Twynam, 1977. Pub!. by the School Council. (4)	‘Greater Than Their Knowing: A Glimpse of S.A. Women 1836-1986’, National Council of Women, 1986, Wakefield Press, S.A.